Take a look at any booklet, magazine, or catalog and you may notice what appear to be a few staples holding it together. These are not staples, however, but a saddle-stitched binding. Because most print jobs are large quantity, using regular staples to bind a booklet would take too much time. Therefore, a stitching machine is used. Instead of single staples, a stitching machine uses a long spool of metal wire which gets pushed through an awaiting booklet and then cut and folded to resemble a staple. Imagine a sewing machine with super strength. Here at Minuteman Press, we have multiple stitching machines including standalone units and all-in-one booklet makers that stitch, fold, and cut within seconds. When folding the booklet in half, the pages on the inside will “creep”, or be pushed farther outward than the pages on the outside of the booklet. To account for this, the booklet is given a face trim to even out the edge. This will give the book a clean appearance. However, we need to be careful with this step. If the booklet is thick, the face trim can significantly reduce the margins of the inside pages. This dilemma can be avoided in the design process. The graphic designer should give the pages a “creep allowance”. This term sounds funny, but it means adjusting the inner and outer margins to allow a face trim with no consequences. 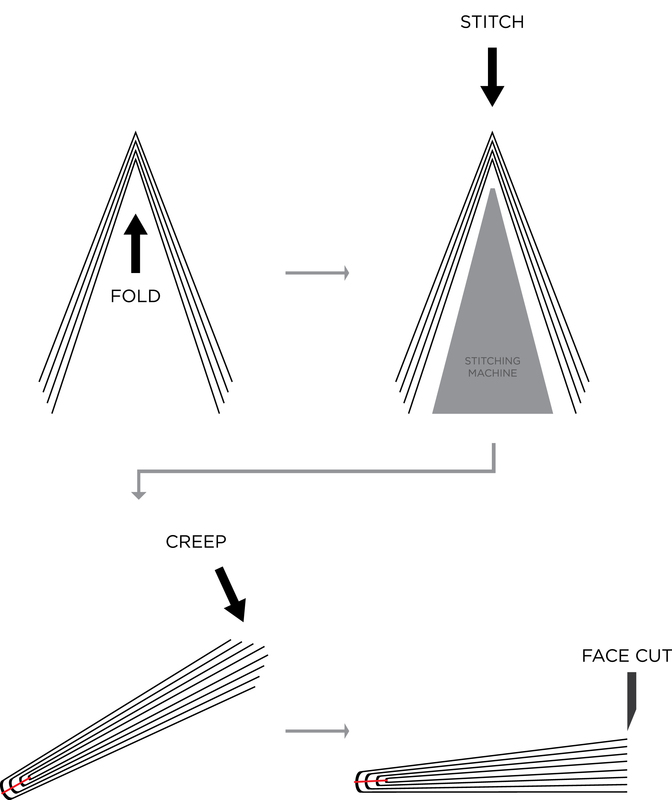 The diagram below shows the way a booklet is folded, stitched, and cut properly. At Minuteman Press, we print booklets in the form of school handbooks, playbills, directories, and owner manuals. We can help you create a new design, or we can work with your digital files. If you have a question about creating a booklet, please contact us any time.